Read about the first invisible skyscraper in the world: the Tower Infinity in Seoul. Every day, a new skyscraper is designed anywhere in the world. Higher and more stunning each time. The highest building of the world never stays the same because people think that it’s never enough. However, not the highest but the first invisible tower is now newsworthy. It may sound confusing but it’s real. In Seoul, the capital city of South Korea, International GDS Architects Company is working on building the Tower Infinity, the first invisible tower in the world. While scientists have been working hard to invent the invisibility cloak, these architects has taken it a step further and they’re just about to build an invisible building. 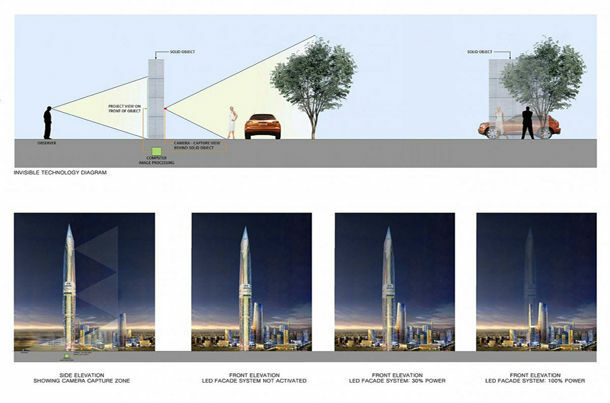 What’s more, it will be 450 meters high! Well, how can they achieve such a thing? Is it possible scientifically? I know you’re asking so many questions, too. However, it seems that they’ve found a possible way of doing this. The tower will be covered by glass completely and through 18 optical cameras, the surrounding scenery will be recorded and simultaneously will be reflected by the LED panels which are strategically located on the building’s facade. So when you look at the building, you’ll not see it but the other things behind. Seems like a bright idea, doesn't it? In addition, the invisibility of the tower will change according to the power level of the LED Facade System. When it’s turned off, the tower will be visible again. And these cameras are usable in every weather condition. The location of the tower is arousing worries among the people because it’s planned to be built in Cheonga, out of Seul, near Incheon Airport! However, the company relieves us by guaranteeing that the reflection will only be on the building and it will not affect the planes while taking off and on. In the Tower Infinity, there will also be a 4D cinema, waterpark, rollercoaster, theme park, restaurants and the highest observatory deck in the world. 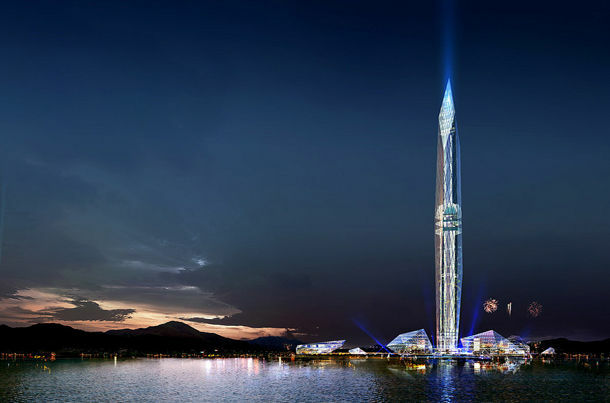 Although the completion date isn’t clear, the Tower Infinity will immediately become the most popular tourist attraction both in Seoul and in the world without hesitation. Unfortunately, David Copperfield’s famous show, making the Statue of Liberty disappear, will start to lose its popularity. What we’re used to is, or in other words, what we have to be used to is big and high buildings. But suddenly, some people come up with an idea of building a high tower and then making it disappear. Confusing enough, yet better than spoiling the view I think.